Discussion in 'General Linux' started by Condobloke, Jan 5, 2019. 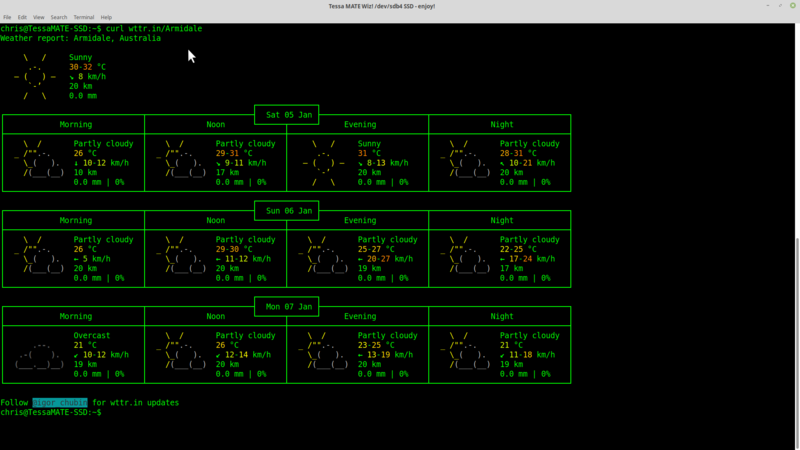 I use THIS in Linux Mint 18.3 to keep me informed about weather fluctuations at various places in another country to the one I reside in now. I have just been informed by the guy who gathers the info that ""It appears that WOEID information has been discontinued. I'm pursuing an alternative. Please contact me if you are interested in a custom solution for your business."" I am certainly not after info for a business......My needs are far more mundane than that. A WOEID is a unique 32-bit reference identifier, originally defined by GeoPlanet and now assigned by Yahoo!, that identifies any feature on Earth. SO....what can i use ? Dare I say "Make Google Your Friend?" Dare I say....I have made mr google's acquaintance on many an occasion...we are old mates, of sorts. Gnome is a waste of time...I installed from synaptic this morning....and it either doesnt know where bloody Armidale is or it tells me the temp there is 36C....in Armidale !!?? Is it possible that Ross Elliot is the only bloke in this world who can make a SIMPLE weather applet ??? I have installed a Firefox extension. its rough, its honesty is questionable, but I will go with it, until some bright fella provides an alternative. took a long slow look through the software manager.....not much to be gained from there. Interesting to note that the majority use Yahoo for their data........they are doomed. Yahoo HAS closed that service down...permanently. 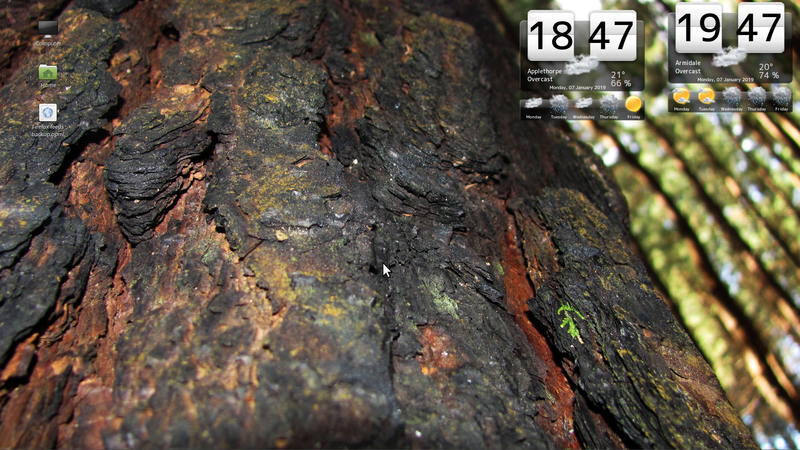 http://www.linuxandubuntu.com/home/best-clock-and-weather-widgets-for-linux - is the site I found. The first one, Gis-Weather, I found crap, too hard to set up city codes and kept getting pairs of nag popups telling me to set it up so blew it away. 2nd one that you see here is My Weather Indicator - you can have two (2) locations, each one generates a small cloud or cloud and sun icon on your System Tray, right-clicking them gives a long context menu of options, readings and preferences - haven't tried much so far. Once setup, in /home/yourusername/.conf there is a folder /my-weather-indicator which contains a filed named similarly as a .conf - haven't checked out size options yet. Well....here I sit...scratching my head. I had already tried that....and I became pissed of with it, because it would not 'locate' armidale or tamworth ....the ppa was already in place, so I fired it back up again, hovered the little circle over nsw....typed in armidale.....and bingo !.....With htis new found success....I did the same for tamworth, and that was just too easy ! It supplies that info via 'openweathermap' ...I am already a member there from my previous attempts with many and various apps etc. Thank you my friend......I guess all it needed was a wizards touch. yeah yeah......I thought it was the ferocity of the bad language I hurled at it. I have found the % rel humidity figure to be a 'bit of a pluck'....so I sent open weather map an email......you never know ! Seems like we have a lack of weather stations there, and this data received from modeling. Now we are working on improvement of our weather station network, and situation should change for the better. Ok...cancel that thought....does NOT work correctly, or consistently. Maybe it is more of a Pet for Puppy?